Are you looking for a solar generator for your RV to replace a fuel driven generator? 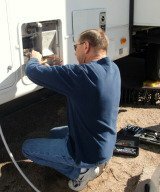 Most RVs today can demand as much power as a traditional house using electricity to run refrigerators, TV, lights, washer dryer units and more. Using a solar powered generator can cut the cost of Rving and provide you with reliable portable solar power. Unlike a fuel generator a solar powered generator is quiet, odorless, capable of lasting a lifetime, are easy to install and simple to use. A solar generator works by converting solar energy into electrical energy which is stored in a deep cycle battery for later use. A solar power inverter converts the DC power stored in the battery into AC power. There are many options available for portable solar power, cheap solar panels, and specifically designed RV solar panels that will generate power all day and store it in the batteries for on-demand use. RV solar panels are available in rigid or flexible configurations. The flexible models can be rolled out or folded for easy transit. A mono-crystalline solar panel generally has a higher efficiency, but the multi-crystalline are cheaper to manufacture. If you enjoy boon docking a solar powered generator could be a good investment, or you can make one yourself for extra cheap solar power. To make your own solar generator with a few supplies from your local hardware and automotive stores. Attach the voltage meter and DC input to the top of the battery box. Attach the meter to the wing nut terminals on the battery. Connect the positive (+) pole first to prevent sparking. Only handle one wire at a time. Connect positive to positive, negative to negative; if incorrectly connected it can destroy the voltage meter. Connect the DC inlet to the battery in the same way. Connect the solar panel to the battery in the same way. If you purchased a power inverter connect it to the battery. Close the lid on the box. Put the solar panel in the sun. Your battery should charge in 5-8 hours. Your solar generator will be able to run radios, fans, and small wattage lights all night, and give about 5 hours of continuous use at 115 volt AC. You can also add larger panels, inverters, and batteries to your system to generate more on-demand solar power.